View of “Hans Josephsohn,” 2015. With elemental force and calm, this exhibition is overpowering: five untitled monumental brass castings, each approximately fifty-nine inches tall, line up on gray concrete bases. A tremendous vertical-format relief on the wall, also untitled, interrupts them. 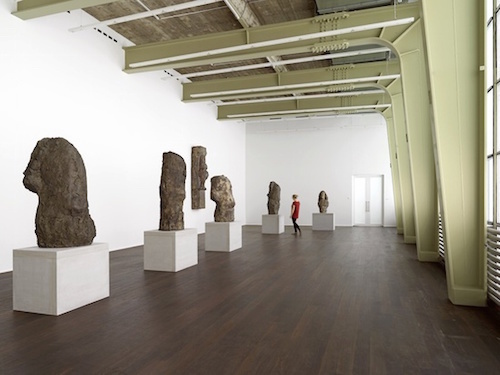 These late works by the German-Jewish sculptor with a Swiss passport, Hans Josephsohn, appear to have been made for this luminous space. Five modernist lime-green steel uprights lift the room aloft. Between them, milk-glass windows from floor to ceiling afford a luxurious light. The light falls on the metal surfaces, is absorbed or reflected by them, gives contour or dissolves, creates curves and depths. Josephsohn held fast throughout his life to the representation of the human form in his work. He created portraits, full figures, standing, reclining, tied to architecture as reliefs. Plaster was his preferred material. He put it through a lengthy working process, at the end of which he selected pieces to be cast in brass or bronze. This way he attained a level of abstraction through which the form lost its unambiguous reference. Thus, it is not by chance that an untitled sculpture from 1995, at a height of sixty-one inches, has the same proportions as the famous, ancient Belvedere Torso in the Vatican Museums. A half-figure is also to be discerned in this piece—the face and torso of Josephsohn’s wife. The artist seems driven by the search for her archetype. Still, none of her likenesses correspond to the ideal completely, much to the pleasure of the observer. It will be a long time before such an exhibition, comparably impressive in its harmony between artwork and space, will again be seen in Löwenbräu.